The T114 (BAT) (Battalion Anti-Tank) is a premium Rank V American tank destroyer with a battle rating of 6.7. It was introduced in Update 1.71 "New E.R.A". 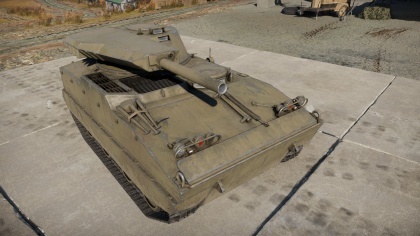 The T114 is the first premium Rank V vehicle to be implemented into the game. The T114 "BAT" looks like it is straight from a science fiction movie, or from a crazy professor's basement. With a circular turret, auto-loader system, and a cannon attached, it has a very unique look. It is very fragile, but is a very dangerous tank with a skilled player in the commander seat. The gun packs a great punch with up to twenty four rounds with 381 mm of penetration from its High Explosive, Anti-Tank, grenades ("HEAT") round. It has the ability to one shot that formidable IS-6 from the front with a skilled shot Yes, from the front!. Considering that the velocity of the projectile is not very fast, it will have to use it almost like a mortar at ranges over 2,624 feet (800 meters). Use the terrain and vegetation on the map to get close then engage the enemy in an ambush. The T114 will be able to one-shot most tanks if clever with shot placement since it is only equipped with "HEAT". The T114 has a three round magazine for the 106 mm gun, so if the first shot fail to hit, another two can be shot off within few seconds. However, the reload of the magazine will depend heavily on the crew skills . The mobility of this vehicle is average to good with very responsive handling at speed. It has a good cross country speed on terrain of around 20-25 mph (32-40 km/h). On tarmac roads, the T114 can get up to 35 mph! (56 km/h). Use this to get into a great hiding spot and await the victim. Tigers, front plate. Panthers, front plate. IS 6, front plate. There is a pattern forming here! However, the armour is very thin and can be penetrated by heavy machine gun fire from opponents. The crew are cramped together towards the front with only the gunner in the turret. The ammo is exposed by the thin layers of armour which forms its protection - which can be pieced with ease. So it is with the utmost importance that the gun is aimed for the most critical parts on the enemy tank. Ideally, aim for the gunner, ammunition racks, or engine. The "HEAT" will be able to destroy any tank with a well placed shot. However, if it is the last shot and it fails to penetrate, run, and find cover before the auto-loading starts. A 5 mm structural steel plate separates the engine from the crew compartment. Belly armour is 25 mm thick. 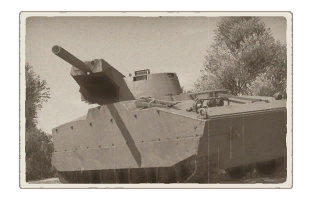 The T114's thin armour means that all enemy vehicles have very little difficulty in destroying the T114 if it manages to hit it. It is also vulnerable to heavy machine guns as despite its armour thickness, it is built of aluminium that only provides a x0.47 effectiveness of its rated thickness. Air strikes are also a concern as aircraft machine gun and autocannon armaments with armour-piercing capabilities are more than able to get through the T114 and hit the delicate internals. Ammo racks of the T114. This tanks play-style is similar to a role of a light tank, with only two crew, very light armour, only equipped with a 106 mm (10.6 cm) Recoiless Rifle armed with High Expolsive Anti-Tank grenade (similar to a RPG). However, it is just as deadly as any other tank on the battlefield! Use the speed it offers to get the advantage of the terrain. Use the vegetation of the map to an advantage. Be patient. Be cautious about walls, fences, and objects on the terrain - These will slow the tank down if they are run over and/or hit. It is important not to let the enemy team spot the T114. Stealth is the key. Wait for the enemy tank to appear and for it to expose its side. Calculate the distance and drop of the HEAT round before firing. If calculated successfully, either the enemy tank will be knocked-out or it have sustained major critical damage such as a loss of a crew or gun breach. If it has sustained critical damage, fire another shot into the opposite area of the tank to knock it out. It is very important to aim and knock out the gunner and/or turret crew. Even if the tank was hit and sustained critical damage, if the turret crew was not knocked out and main cannon was inoperable, the machine gun will still be able to penetrate the T114's armour since it has only 32 mm of thickness on the sides and rear with the turret at 38 mm while the front has 44 mm. The last round in breach before the auto-loading starts is very important.. Make sure to use it wisely and with caution. If all three rounds are fired, the auto-loading will happen. If the enemy tank is still alive, withdraw as fast as possible and hide until the gun has been loaded. In arcade battles, the T114 can be played akin to that of the M18 Hellcat with excellent firepower and mobility, but lacking in armour...very lacking in armour. Since the advantage of surprise and concealment is nullified in Arcade due to the nicknames appearing in that game mode, a more cunning usage is needed in ambushes and brief exposures with maximum damages. The best ways to use the T114 in arcade is to maximize the gun depression and in "pop-up" manners. Try to find engagements where the enemy is pre-occupied with allies rather than on the T114 to alleviate some risk of being fired upon when spotted. When approaching, find a hill to creep up to until finding the right point where the gun depression allows the recoilless gun to be aimed at the target. If there are no hills, approach from behind hard cover like a wall and then peek out with the gun pointing at the enemy. It is recommended to approach the wall angled with the front left section towards the wall at an angle, since the gun is mounted offset in the turret to the right, to minimize the exposure of the vehicle when peeking out for a fire. Another way is to reverse out of cover as it would also minimize vehicle exposure of the front. Do not rely on crew damages to save the vehicle and be able to retreat as since there is only two crew members in the vehicle, a single hit that incapacitates a crew will send the vehicle to crew replenishment, immobilizing it for an easy target. In either case, once exposed and on target, fire the first round and then withdraw back to cover while the autoloader loads the next round. If feeling confident, and fighting a lone tank that has an incapacitated gunner, then it is possible to simply stay in place while the cannon reloads the next round. If aimed correctly, the second should be able to destroy the enemy vehicle, if not then fire the last round in for a final touch, then withdraw while the autoloader is reloaded with three more rounds for another go at another target, or the same one if it is still not destroyed. If an engagement ends with one more round in the autoloader, it is better off firing the last round and let the autoloader stock up with a fresh supply of three more rounds. Continue until destroyed or achieved victory in the T114. In realistic/simulator battles, the T114 have the ability to cause mayhem behind the enemy lines without to much hindrance. Go to a capture point on the left or the right flank, wait for targets to appear, and while they are not looking (this is very important) open fire. Try to knock them out or into a state where the tank can get assists. If juggling more than one target, be sure not to be spotted. Once the auto-loading has started, head to cover and wait out the reload. Then, plan another attack. Stay out of sight, even back track and flank harder and deeper. The best way of getting to the enemy's rear is to use the terrain. Do not drive up the middle of the road or the middle of the map. It will be very easy for the enemy team to knock out the T114. Use the vegetation on the map combined with the terrain and sounds coming of the enemy to avoid any contact with the enemy forces. Find and locate an area with high vegetation or some urban area which hides the silhouette of this small tank. Lay silent, like a wolf, until the enemy is close. Stay alert. The enemy may be trying the same tactics with other vehicles. Once the enemy is close, wait for them to expose their side armour where the "HEAT" will be able to penetrate them and cause major critical damage, if not blow their turrets clean off their fine vehicles of war. Within urban areas, do not make the T114 known until it is too late. Only pick one tank off at the time. Do not hunt multiple enemy tanks. That will not end well. Make sure the silhouette is not exposed. Simple machine gun fire can terminate this fine tank. Great control input at high speed. Can penetrate any tank at its rank with a well placed shot. can be hidden inbetween the map vegetation. Only HEAT, no other rounds available. Limited ammo, only three shots per clip. Only carries eight clips, giving it 24 rounds. No external .50 machine gun, which can be used to fight back against planes. Can only elevate the gun up to a pitiful 8 degrees. Long reloading time for the auto-loader, up to 11.65 Seconds with a full trained crew. Long reload speed, while the loader adds new three-round clips into the magazine. Loses majority of its speed when it runs into foreign objects i.e. fences, wall, rocks etc. Low profile, makes seeing over tall bushes, long grass, rocks, and other tall objects very hard. 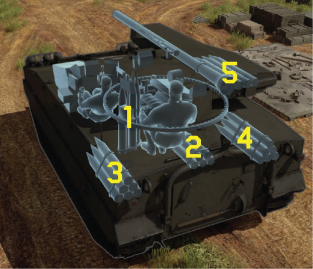 Low profile would require exposing the tank weak armour when firing if the gun view is blocked by a tall object. Crew is cramped together, a short burst from a machine gun can knock them both out. Crew is sitting around ammunition which can be penetrated and detonated by machine gun fire. This page was last edited on 30 January 2019, at 06:08.